Size of this preview: 549 × 600 pixels. Other resolutions: 220 × 240 pixels | 439 × 480 pixels | 703 × 768 pixels | 937 × 1,024 pixels | 3,000 × 3,277 pixels. English: This is a T-72A tank, which can be clearly identified by the smoke grenades on the front turret. 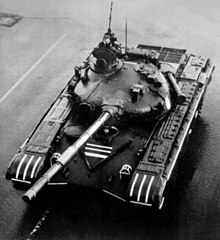 The T-72B has the smoke grenades in a stack on the left side and indentations on the front turret roof for the new inserts. Original caption [misidentified]: "Front view of a Soviet T-80 main battle tank. "Soviet Military Power," 1983, Page 39. Date Shot: 1 Apr 1983"
2005-12-01T12:19:03Z User:Harald Hansen 3000×3277 1.19Gb Source http://www.dodmedia.osd.mil/ ID: DNSN8307101 Caption: "Front view of a Soviet T-80 main battle tank. "Soviet Military Power," 1983, Page 39 Date Shot: 1 Apr 1983 "